Virginia Gov. 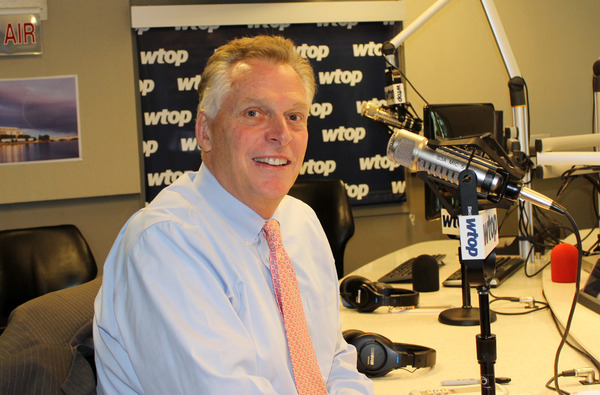 Terry McAuliffe joined WTOP on Wednesday, Oct. 25, 2017 for "Ask the Governor." WASHINGTON — Virginia Gov. Terry McAuliffe implored his counterparts in Maryland and D.C. on Wednesday to agree to shrink Metro's governing board to five people in order to help set the troubled transit agency back on track. McAuliffe said he wants to convince Gov. Larry Hogan and Mayor Muriel Bowser to agree to the smaller board by the end of the year to help convince members of the General Assembly to support long-term, dedicated funding for Metro, which needs as much as $15 billion to replace outdated and worn out components like rails, power equipment and even trains. He said Virginia lawmakers want to see action. The current 16-member board is made up of political appointees — most of them local elected officials. He said the board's inaction — like not replacing major components of the system in 2006 after three decades of wear and tear and taking a year to hire a general manager — still make him angry. "We've just got to show leadership and get this off the table," he said. McAuliffe has suggested that the smaller, nonpolitical board would serve for three years. McAuliffe has pledged to include dedicated funding for Metro in his two-year budget proposal due in December. He has not said what form that funding would take — such as a tax increase or a new tax — nor how much he would provide. Hogan has proposed that each of the four jurisdictions that serve Metro — the two states plus the District and the federal government — should each chip in an extra $125 million per year over the next four years to provide a temporary funding boost and buy officials more time to hammer out a longer-term fix to Metro, which has lost revenue as ridership has declined. "We call ourselves the capital region — we always love to talk about the greatest region in the world. Let’s start acting like it. And we need a world-class transportation system." A report that will recommend changes for Metro — including to bus service and staffing costs — from former Transportation Sec. Ray LaHood is due out in the next few days. McAuliffe, who has been briefed on the report's contents, said the document contains no surprises. McAuliffe, who is a close friend of Bill and Hillary Clinton, said he was not surprised that her presidential campaign and the Democratic National Committee paid for opposition research on her opponent in the 2016 presidential election, Donald Trump. He said he didn't know anything about the group hired to do the research, which compiled a dossier on Trump's alleged ties to Russia — connections that are now being investigated. And he downplayed suggestions that the source of the dossier gives more credence to Trump supporters who suggest that a federal investigation into Donald Trump's Russia connections. McAuliffe led Clinton's first run for president in 2008. He played a secondary role in her campaign last year but still helped her to carry Virginia. The governor feels confident in Democrats' chances when Virginia voters head to the polls in two weeks. He said Virginians are generally happy with the job he's done and with the direction the state is going. Meanwhile, they are not happy with the direction the nation is heading under President Trump's leadership. He said that those two factors would help drive turnout on Election Day. Virginia's off-year gubernatorial elections typically draw fewer voters than presidential years. McAuliffe is bared by term limits from seeking a second term. Polls show the top two candidates for governor Republican Ed Gillespie and Democrat Ralph Northam, who is McAuliffe's lieutenant governor, are running neck and neck and the number of attack ads has grown as the race nears the final stretch. Northam's campaign has associated Gillespie with those who took part in a white nationalist rally in Charlottesville in a new campaign mailer. McAuliffe defended Northam's record of public service and accused Gillespie of running a divisive, "gutter campaign." "He’s trying to scare people," McAuliffe said. He said that Gillespie's ads on the MS-13 street gang and restoration of rights for felons are playing on the fears of Virginians and stoking bigotry. McAuliffe defended his approach to restoring the civil rights of felons — automatic restoration once they've completed their sentence and restitution. He's given the right to serve on a jury, vote, and be a notary back to 168,000 felons and called it his "crowning achievement." Northam has said he supports automatic restoration for all felons and Gillespie has said he would narrow the criteria for who would be eligible for rights restoration. Restoration does not include gun rights, which requires a separate judicial process. Successive governors have streamlined the rights restoration process in order to grant relief to more offenders how have completed their sentences. McAuliffe: We need to get to a 5-person board - get the politics out of it - and we'll be in good shape. Expecting the Ray LaHood report any day. McAuliffe: He has a good idea what the report will say. Lot of misinformation about our costs - costs not out of line. Have to look at pension cost and cost of bus service. McAuliffe: They should have done lot of the repairs 11 years ago - well beyond the replacement time - will cost more money to do it. McAuliffe: No big mystery in the report - has some big suggestions. By the end of the year, wants to see a 5-person board. We've been talking about this for a couple years. Took too long to hire a CEO. DC and Maryland working to attract Amazon - as a region powerful if work together. We need a worldclass transportation system. Thanks for your questions! We're sending them into the studio. McAuliffe: 66,000 children could lose their health coverage in Virginia by the end of January if Congress doesn't authorize funding. McAuliffe: Message to Congress: Get your act together and do something. McAuliffe: He predicts the General Assembly will expand the state's Medicaid program next year, accepting federal funds to pay for it under the ACA or faces "gutting" K-12 funding. On to decriminalizing marijuana - legislature is studying it. He would support it but he hasn't heard whether lawmakers are serious about it. McAuliffe suggests that flipping seats in the House of Delegates would allow more progressive policies like decriminalizing marijuana would to become law. That's it for this month. Thanks to everyone who joined us and for your great questions. Given that it has the dubious distinction of having the worst traffic jams in the US, why not consider releasing all EZ Pass restrictions on I-95 between the Beltway and Fredericksburg on weekends only? Would at least relieve the dangerously increasing weekend tie-ups and incidents which then spill over onto Rte. 1 and other area roads. So disappointed to hear this interview. The governor sounds way too much like Trump, calling Ed names and comparing audience numbers for rallies for the candidates. Also, can he answer questions with accusing others of the typical liberal name calling - everyone who doesn’t agree with them is a bigot. He would get a lot more people listening to him if he stopped the liberal, Clinton-ish, overused tactics. But I am not surprised...just wishful thinking. Compared to other states, Virginia has been relatively well-managed fiscally through governors and legislators of both parties. Why is that? What is it about Virginia that makes it that way? Can you just tell us what you're going to do and stop blaming Trump and stop throwing insults at President Trump? Be marure and talk about fixing state issues and helping stars economy. Governor, I have been at some of your speaking events and when you walk in the room. The room is full of energy. Your passion, your vision is effervescent. When will we, the voter have the opportunity to call you Mr. President ?? Could Gov. McAuliffe please ask Gov. Larry Hogan to come on WTOP for an Ask the Governor interview. Of course, I would be happy to participate in an Ask the Next Governor segment. Thank you. For more info about me check out www.MadalenoForMaryland.com. Wondering if there is going to be a grace period for people using 66 toll lanes. It was mentioned in the news not enough people have the ez pass for the toll lanes. Q: With all the development expanding the tax base and increasing government revenues, why do we need to pay for new roads AGAIN with tolls? What does he think about the DNC and Clinton campaign and the Russians?? I hope that the democrats are intelligent enough to see through his fear mongering. Ask why the schools are broke? He appointed the board. What about the Clinton campaign paying for fake Russian report?? We'll post the full audio and a story shortly.